The nerd is the word! It’s difficult to define what’s cool and what isn’t. Throughout my adolescence I noticed that the trend of being ‘cool’ would typically be doing something different to stand out, but at the same time act like you’re not trying to. For me, one of the first signs of nerds or geeks becoming ‘cool’ was stemmed from a popular teen television series “The OC“. 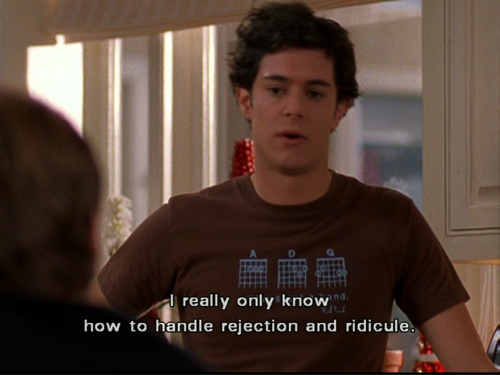 The role of Seth Cohen played by Adam Brody was depicted as a nerdy and shy teenager who had no friends but came from a wealthy family. His time was devoted to comic books (he actually created his own), superheroes, drawing, video games and the like. Money is continuously outlined in the show, as Seth went to an elite high school and then on to college which is contrasted to other characters who didn’t have that opportunity (who were not ‘nerdy’). It was obvious Seth was not ‘cool’ or accepted by his peers at school as he was bullied and portrayed as a social outcast. Throughout the series, Seth’s quirky personality and witty humour began to draw the attention of others not to mention viewers of the show fawned over him. Why? Because he was not considered the ‘norm’ and even though he tried to blend in and not be noticed, he stood out because he was so different to the other teens. I noticed more and more people posting things online (especially blogs) about superheroes, comics and intellectual pieces of work such as poetry, stories etc. Fashion is also a massive factor during the transition of nerds becoming cool. Websites have even been produced to get the character Seth Cohen’s fashion. Headings such as “Geeks get the girls”, “Geek chic”, and “Targeting teen trends” are a great example of how nerds have made their way acceptable into society. Collared shirts buttoned all the way to the top, skinny jeans rolled up above the ankle and thick black framed glasses are some prime examples of what is ‘cool’ and accepted now – yet if you were seen in any of these items just 5-10 years back you would have been considered nerdy of course, but with a more negative connotation. The minority has moved to the majority and people are continuously trying to find ways to be different but they eventually become mainstream.